Wanted to pop in and say Happy Thanksgiving and share these beautiful Gothic chairs now residing in my dining room! They came out of a church not too far from my house, but had been in a friends garage for years....I painted them white and added some linen chair pads...I LOVE them! I also wanted to say--yes, I'm still here....I'm currently re-doing my bedroom, which has been a work in progress for some time...I finally have all the pieces, I just have to find the time to work it all together! Let's just say it is going to be beautiful! 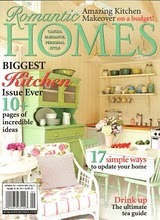 Also, don't miss my article in December 2012's Romantic Homes Magazine--in stores NOW through Mid-January! You can also track me over at www.PetersburgPickers.com! I'm now working full-time doing Estate Tag Sales! Talk about lots of things to be thankful for this year! Keep reading for more photos! My friend is also going to give me some Chippendale chairs to replace the teal bistro chairs. They will fit around the table better. I am going to paint them out white, and re-do the seats with linen. I can't wait to get that done! You can also see that I still have up my Halloween decor...shame on me....I'll be getting the Christmas stuff up next week, because I have an Estate Tag Sale to tend to...our 6,000 square foot warehouse is packed to the brim! We're taking Thanksgiving Day off, but will be there Friday-Sunday! Friday is 25% off, Saturday is 50% off, and Sunday is at least 60% off! See photos of the current sale here. For those of you who are local, we are located at 230B East Bank Street, Petersburg, VA 23803--we are right across from Demolition Coffee and a stone's throw away from the heart of Old Towne--where much of the new movie, Lincoln, was filmed! I'll be back soon with more, including my new and non-traditional take on a Christmas Tree!!! *I apologize for the overuse of exclamation points in the post!